There are squirrels trying to get into my attic. How can I deter them from making a home for themselves for the winter? First you want to make sure that squirrels haven’t already gained access into your attic. Secondly, if it’s between March 1 and October 1, it could be a female with dependent young – you definitely don’t want to complicate the situation by trapping the nursing female and/or dependent young inside. But I digress! Squirrels will try and gain access into attics to escape the harsh realities of Canadian winters. It is never recommended to keep squirrels in your attic over the winter. 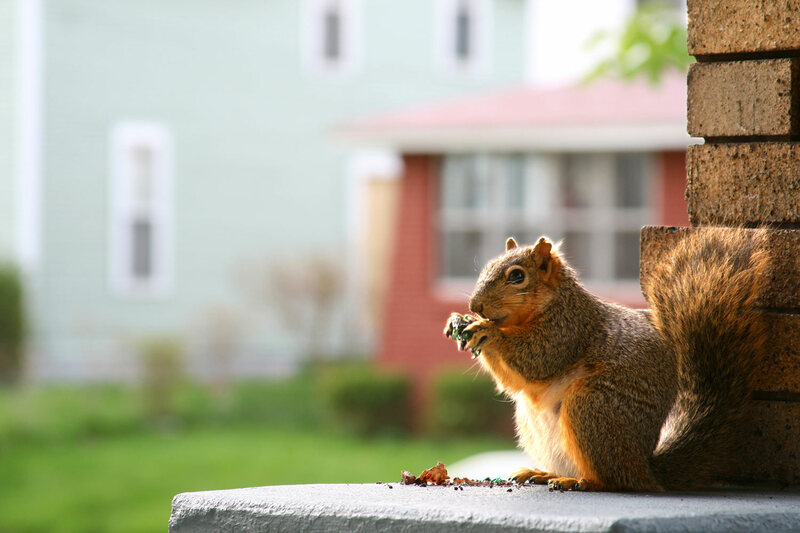 If you have trees or branches that are within approximately 2.0 metres to 2.5 metres of your house, squirrels can leverage these to gain access to your attic. To keep squirrels from climbing the trees, create a tree collar using sheet metal. The tree collar should be a band that is 90 cm wide and placed 2.5 metres off the ground. Drill a hole in each of the four corners. To keep the sheet metal from damaging the tree as it grows, secure the ends of the sheet metal with two metal coils between the drilled holes. Trim any tree branches that are within 2.5 metres of the house. Seal all possible entry points. ½ inch hardware cloth (also known as welded wire mesh) can be used to seal access points. Cut the hardware cloth five centimetres larger than it needs to be on all sides. Centre over the access point and secure it in place with nails or screws. Grey or black squirrels are a common sight in urban and suburban backyards. Download this wallpaper of the red squirrel. Q. How do I stop squirrels from nesting in my car engine?